It’s Follow-Up Friday: Kickstarter Roundup edition! And today, I’d like to return to the subject of crowdfunding! I’ve covered various campaigns for board games, card games, and puzzle projects across the Kickstarter and Indiegogo crowdfunding platforms over the years, and today I’d like to share a few more that could use your attention. 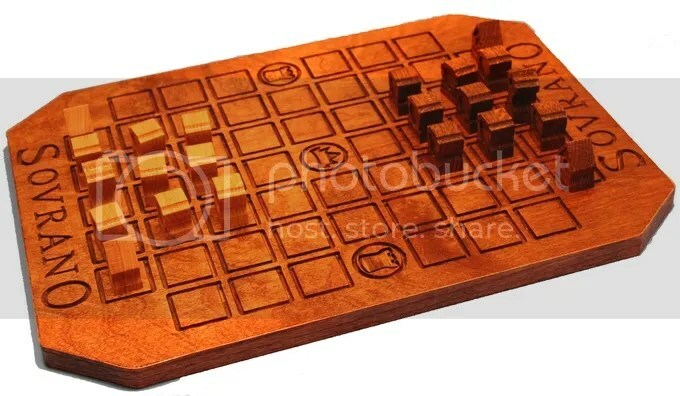 The first is the strategy game Sovrano. Sovrano is a tactical game in the spirit of chess where you compete with your opponent to score points by capturing one or both of the towers in the center row of the board and/or by escorting your emperor to the throne at the center of the board. With only 11 game pieces apiece, this multi-tiered game is simple to learn but contains enough depth and nuance to keep players interested. Although supporting Sovrano is a bit more expensive than the average game’s Kickstarter levels, it’s worth noting that each game is hand-made by the father-and-son team behind the game, and the craftsmanship looks gorgeous. A bit more complex and cutthroat than Sovrano, Summit is a strategy game that’ll test your speed, cunning, and karma. It’s kind of like The Oregon Trail, but with other wagons racing you. Summit combines path building (by laying triangular tiles on the mountain map), mechanics to help or hinder opponents (inspiring alliances and encouraging betrayals in equal measure), resource management, and an element of luck to create an intriguing racing game where players compete to climb AND descend a mountain before their opponents do. On the simpler side of things, we have Hoard, a test-your-luck card game all about hedging your bet to sneak as much treasure as possible away from a sleeping dragon before it awakes. With elements of Memory (remembering which treasure cards are hidden where), chain-solving (doing your best to combine where to move on the board with the cards in your hand and the treasures you’ve already nabbed) and risk management (do you try to wake the dragon now to secure your treasure, or do you hedge your bet and try to grab more before someone else wakes it? 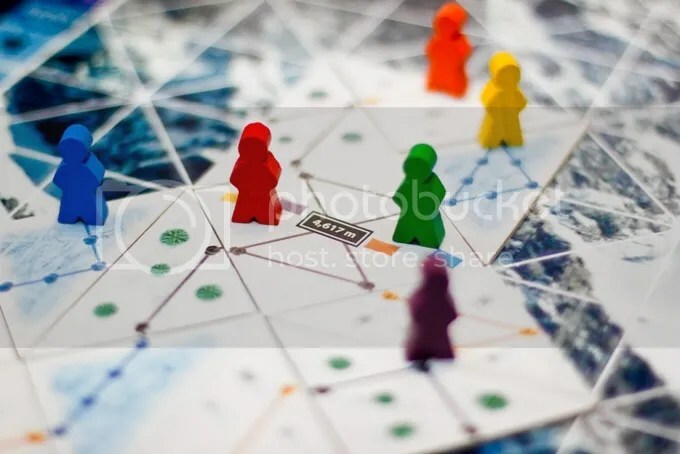 ), Hoard is a quick-playing family-friendly experience that could be a great gateway game for more involved games later. 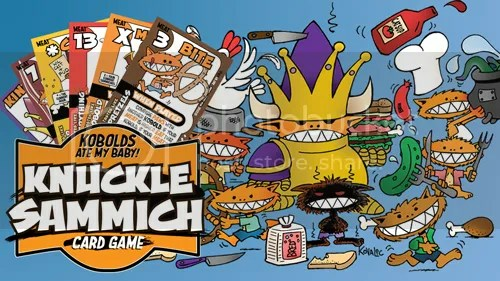 Our final game today, Knuckle Sammich, is far, far goofier than the other three, but it’s a project near and dear to my heart, because it’s a spinoff of one of my favorite quick-and-silly role-playing games, Kobolds Ate My Baby. Now, for the uninitiated, a bit of backstory: kobolds are among the first creatures you usually encounter in a Dungeons & Dragons campaign, because they’re easy for even the greenest of heroes to defeat. They’re basically cannon fodder. So it’s great fun to have a game centered around playing one of these easily crushed minions, stealing food for your king and being generally mischievous. And now they’re launching a card game all about eating sandwiches before they run out…or before you become lunch yourself! It’s guaranteed to be glorious chaos. These are four intriguing and very entertaining projects, all loaded with potential, and I hope you consider contributing to one or more of them. 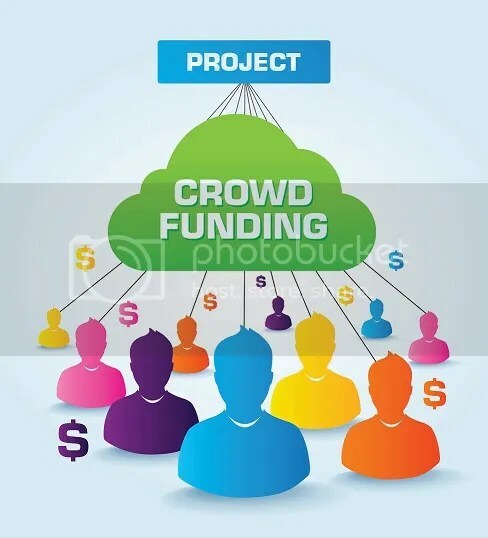 As someone who has become a regular donor to various Kickstarter and Indiegogo campaigns, I am proud to have funded some marvelous new ideas and watched them take shape over the months that followed. Even if you don’t know the science behind it, you’ve probably heard of Schrodinger’s cat at some point in your life. If you haven’t, let me give you the short short version: there’s a box with a cat in it, and a substance that may or may not release inside the box and kill the cat. So until you open the box, there’s no way of knowing whether the cat is alive or not. Schrodinger posited that, since we can’t know which is the case, both are true until the box is opened. It’s essentially a thought experiment which delves far deeper into quantum mechanics and particle physics than I’m going to in this review. Schrodinger’s Cats was funded through a Kickstarter campaign last year, and it’s the brainchild of Heather Wilson, Heather O’Neill, and Chris O’Neill. 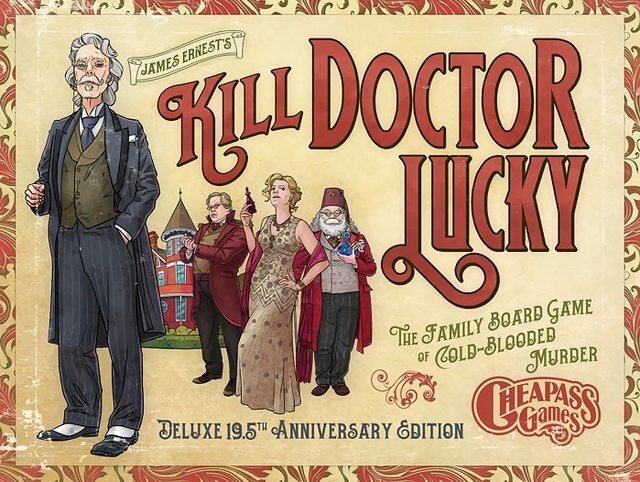 A mix of bluffing, deduction, and wagering, this game combines Name That Tune-style bravado and strategy with Poker-style game play. 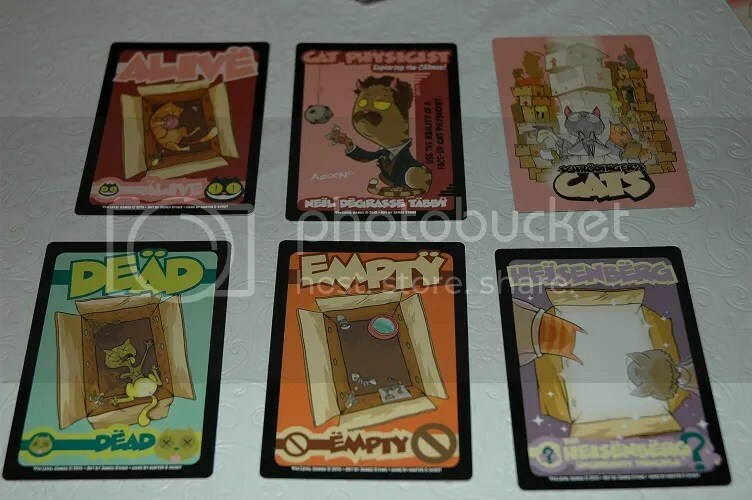 Every player receives one box card for each player in the game (so if there are three players in the game, each player receives three box cards), as well as one cat scientist card. Once the cards are dealt, players look at their box cards and see what each box contains, hiding this info from the other players. Then the players begin hypothesizing. They wager on how many of each result are in ALL of the boxes on the board. So, in the game layout above, there are nine boxes, and each scientist has to wager what’s in all the boxes. When a player either refuses to wager higher or challenges another player’s hypothesis by yelling “Prove it!”, all of the boxes are revealed and the hypothesis is proven or debunked (meaning the player stays in the game or leaves). 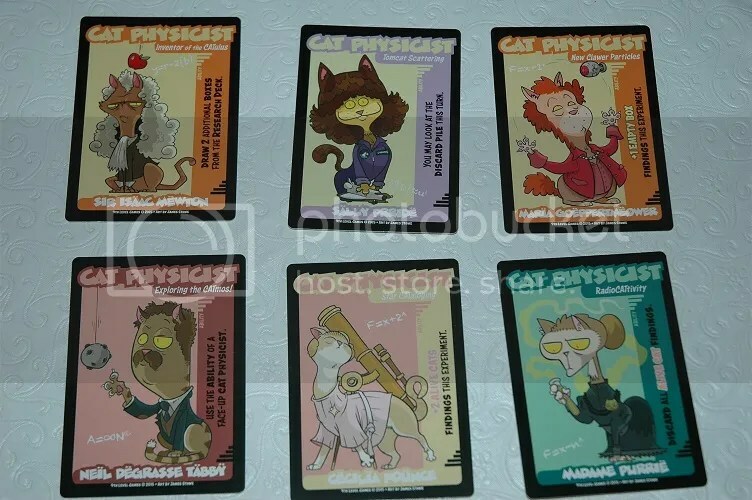 After multiple experiments (rounds of play), one character remains and wins the game (and an honorary doctorate from Cat Tech University). What I enjoyed most about this game (other than all the pseudo-scientific jargon involved in playing the game) was the wagering, bluffing, and reading of opponents that is integral to the game play. With so few possible cards to reveal (only four, in varying quantities, as opposed to 13 different cards across four suits in poker), it’s not nearly as challenging as the classic card game, but offers a lot of similar game mechanics. It’s great fun to try to outwit or read your fellow players in order to make the best hypothesis, and that’s a sort of puzzling that is often left behind in puzzle games. 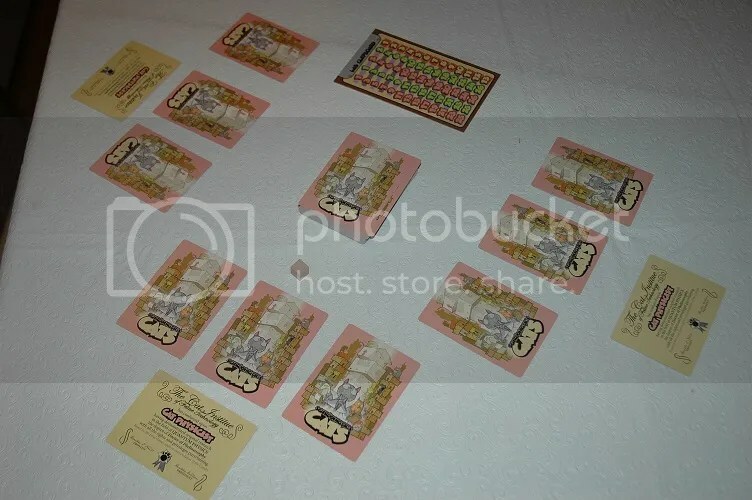 Often, you’re so busy trying to achieve a certain goal or acquire points that you stop actively interacting with the other players; but in Schrodinger’s Cats, a lot of puzzling and game play takes place in the actions and reactions of the other players. It’s a delightfully social game. Although you can play with as few players as two or as many as six, I recommend playing with at least four characters to keep the game moving and interesting. Between raising hypotheses, showing findings, and trying to puzzle out what your fellow players are hiding, the more uncertainty you can introduce to the game, the better. 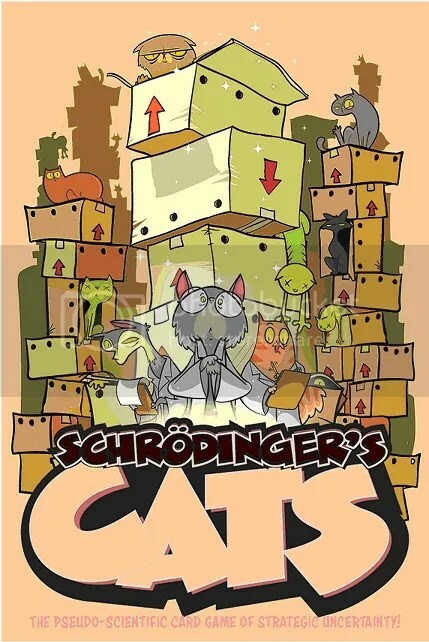 Schrodinger’s Cats is available from 9th Level Games and can be found here.